Let these Lenormand Anchor card combinations help you learn to read Lenormand combinations. They aren’t designed to be memorized because, as you’ll soon learn, the actual number of possible card combinations is endless. 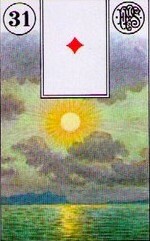 Until then, these Lenormand Anchor card combinations can guide you in your studies. The entry for anchor + stars (35) is missing. Actually, card 35 is the Anchor (which is why you don’t have Anchor + Anchor). Meanwhile I verified, and the Anchor + Star (16) is indeed part of the list! Thank you for looking into it though!